It is difficult to overstate the extent to which visual representation are, and always have been, an integral part of the world of boxing. While boxing is often described as the most literary of sports, lending itself, for various and complex reasons, to compelling verbal representations better than any other sport, it is also the most profoundly visual of sports. Boxers have always been visual icons. From paintings and statuary in Greece and Rome to sporting prints of the epic battles of the bare-knuckle era to photographs of the great John L. Sullivan and Gentleman Jim Corbett to the many iconic images of Muhammad Ali, portraits of boxers have played an essential role in the cult of the boxer as hero and idol. To this day, the walls of boxing gyms are plastered with posters and pictures of the greats of the sport, both past and present. If gyms are temples, the pictures on the wall are icons, representations of saints. The images are there to be worshipped but also to serve as inspiration, to provide role models, and to impart a sense of history and visual literacy to young boxers. 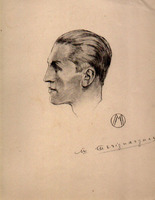 Carpentier fans could also buy a “suite of original prints” by an artist named M. Merignargues. The twelve prints begin with a profile portrait of the handsome boxer and include representations of him in motion, throwing various punches from various angles, bare chested and in his customary white form-fitting trunks and black boxing shoes. These prints are in all likelihood artistic renditions of, or at least very heavily inspired by, the Noyer postcard series. This is obvious in the profile portrait and in a variety of sculptural poses, including a full-length pose in which Carpentier’s head is turned to the side, his left arm fully extended and his right cocked back at shoulder height, almost as if he is poised to shoot an invisible arrow from an invisible bow. Fans with more high-brow tastes were no doubt attracted by the “real art” allure of the prints (while not great art, they are in fact well done and esthetically pleasing). Carpentier’s image was not used merely to sell itself, however; it also served to sell a surprising range of consumer goods of various kinds. Given his well-deserved reputation as a snappy dresser, the ads for hats and suits make sense. Less obvious was the line of aluminum pots and pans that bore his name (and in which he infamously invested, and lost, a considerable chunk of his fortune). An ad in the January 1, 1921 edition of L’Echo des sports exhorts readers to take advantage of a special offer for what appears to be a line of pots and pans for children (“It’s not too late to make your children happy”). In the February 2 edition, there is another ad for Carpentier pots and pans, this one presumably for adults. It shows Carpentier, bare chested, handing out pots and pans directly from the factory to a clamoring crowd below. There was also a radiator cap made in the likeness of Carpentier, for those fans who wished to have their idol riding with them on their travels.